Mid-Life Cruising!!! 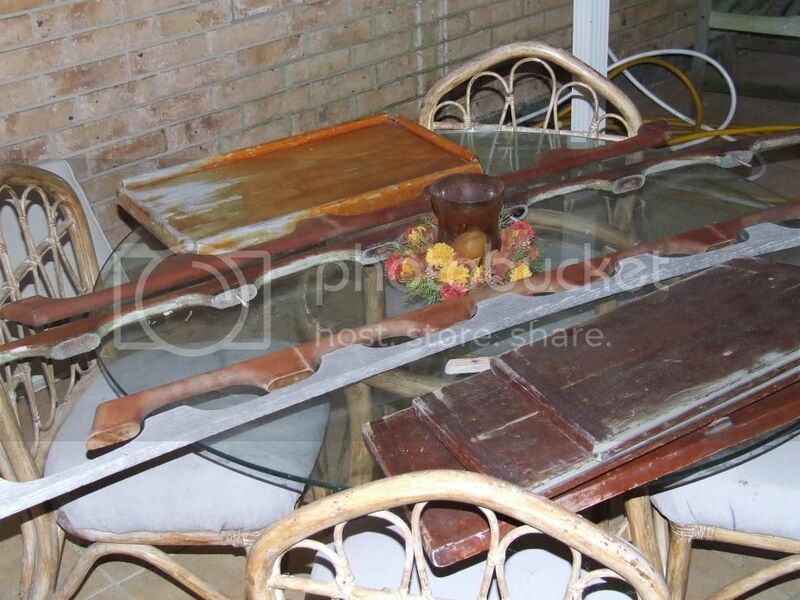 : Pirates and Teak! 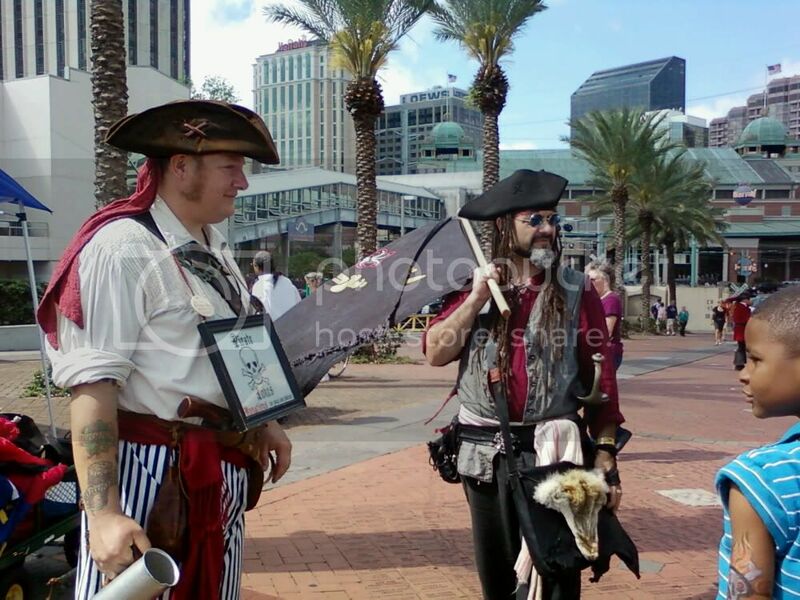 This past Saturday Ken and I headed to the New Orleans French Quarter for the annual NOLA Pyrate Fest. 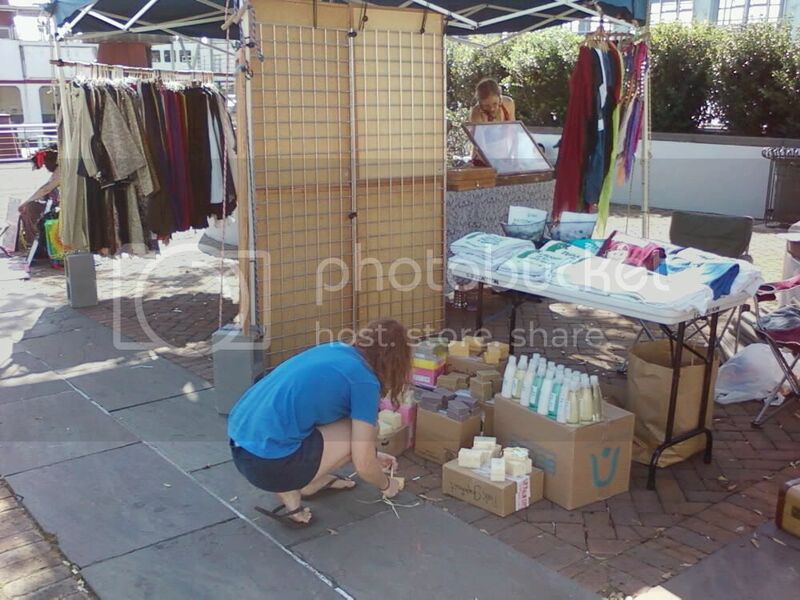 We were actually one of the vendors at the festival, selling our t-shirts, soaps and lotions. We were located on the river walk, with a great view of the Mississippi river. 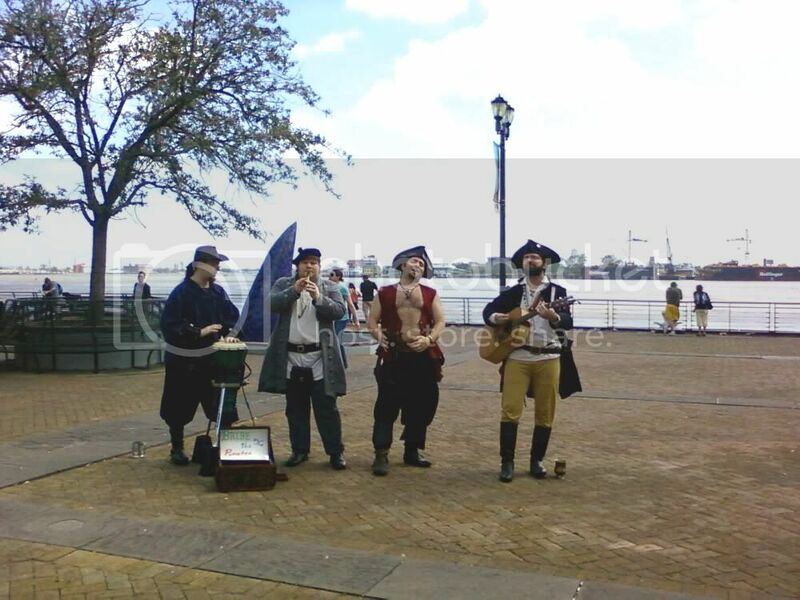 A "pirate" band that had me singing "yo ho ho and a bottle of rum" for the next two days and my little store. The weather couldn't have been better for sitting outside all day, and we enjoyed a nice breeze from the river. In fact, we were glad we didn't have a tent or an umbrella because some of the vendors had a hard time keeping them on the ground! Our booths were also right in front of the aquarium, so Ken and I received wrist bands which allowed us to use the aquarium's bathrooms. After 2 or 3 trips to the bathroom, Ken and I were able to see the whole thing. I especially liked the jellyfish and sting rays (both are so graceful), while Ken liked the penguins. Ken and I had planned on attending the festival Saturday and Sunday, but to be honest this wasn't much of a festival! Other than us vendors, we saw a total of 10 pirates (5 couples) all day. WTH?! We found ourselves trying to sell "pirate" goods to mothers coming out of the aquarium with their children ... not good! We did sell 4 bars of soap and one shower gel, but after parking and gas we broke even (not to mention vendor fees). So, we were very disappointed but made the best of the day and decided that paying for gas and parking again on Sunday probably wasn't worth it. A few days earlier Ken needed to fill some time for his helper, so he removed some of the teak on our sailboat for him to start stripping and sanding. This consisted of the two indoor handrails, two outdoor handrails, two pieces of round trim in the cockpit, the cockpit table, and the three sections that make up the sea doors. Ken's helper did a great job stripping and sanding but did not finish, as this can be a very time consuming job. With Sunday now free, Ken decided to finish this project as well as strip the teak around the companionway. Nirvana also had some gray teak boards on top that really couldn't be removed and didn't have much of anything to strip. So, Ken hit the teak with the pressure washer (water only) while washing Nirvana. We were amazed to see the gray wash away and become a warm, red color! We know that pressure-washing teak isn't recommended because it causes the grain to raise up, but after a little research we were comfortable with doing so then lightly sanding the "raised" grain. Teak in need of some refinishing! So, even though our weekend didn't go as planned it turned out to be another good one. Sunday evening left us feeling a sense of accomplishment, as Nirvana is now clean and the teak is stripped, sanded, and ready for cleaning and protecting! Sorry your weekend didn't turn out as well as you hoped, but it appears that you rolled with the punches and made the best of it. Good for you. Too bad about the turn out for the Pirate Fest, but great progress on your teak trim. Taking it off to finish is the best way of doing it. I've done mine in place and it is a pain to do a good job. Can't wait to see photos of Nirvana when it's all back in place and finished.